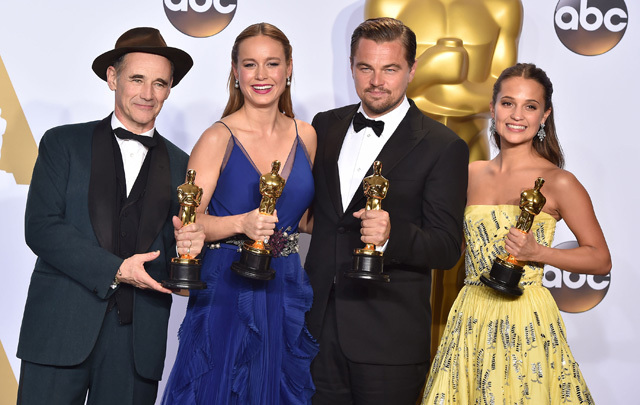 Academy Award winners Leonardo DiCaprio, Brie Larson, Mark Rylance and Alicia Vikander will present at the 89th Oscars, show producers Michael De Luca and Jennifer Todd announced today. All return to the Oscars stage after winning last year in their respective acting categories. Hosted by Jimmy Kimmel, the Oscars will air live on Sunday, February 26, on the ABC Television Network. DiCaprio won last year for Actor in a Leading Role for The Revenant. He was previously nominated for his performances in The Wolf of Wall Street (2013), for which he also received a Best Picture nomination, Blood Diamond (2006), The Aviator (2004) and What’s Eating Gilbert Grape (1993). His film credits also include The Great Gatsby (2013), Django Unchained (2012) and J. Edgar (2011). Larson’s performance in Room earned her an Oscar for Actress in a Leading Role. She has also appeared in Trainwreck (2015) and Short Term 12 (2013). Her upcoming films include Captain Marvel, Kong: Skull Island, The Glass Castle and Unicorn Store. Vikander won for Actress in a Supporting Role for The Danish Girl. Her recent film credits include The Light between Oceans (2016), Jason Bourne (2016), The Man from U.N.C.L.E. (2015) and Ex Machina (2015). Her upcoming films include Euphoria, Submergence and Tomb Raider.